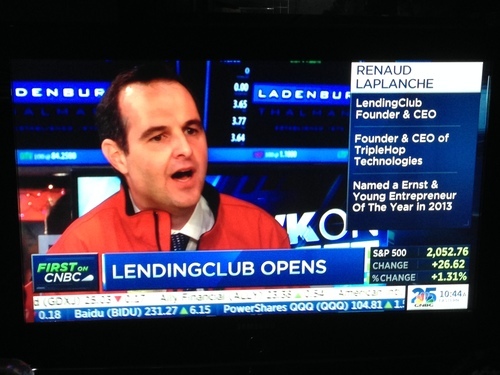 P2P lending innovator Lending Club made its public debut on Thursday. After an initial overnight pricing at $15, shares of LC opened higher this morning by more than 64% before finishing their first day on the New York Stock Exchange at $23.43. The 57 million share offering raised more than $865 million for the San Francisco-based alternative lender, which now has a valuation of more than $8 billion. Lending Club CEO Renaud Laplanche, CEO and founder of the company, owns 4% of the company, a stake worth more than $200 million as of today’s close. Lead underwriters for the IPO were JP Morgan, Goldman Sachs, Citigroup, and Credit Suisse. Lending Club’s growth since its founding in 2007 has been impressive. Operating revenues grew from $1.3 million to $98 million in the four years from 2009 to 2013. 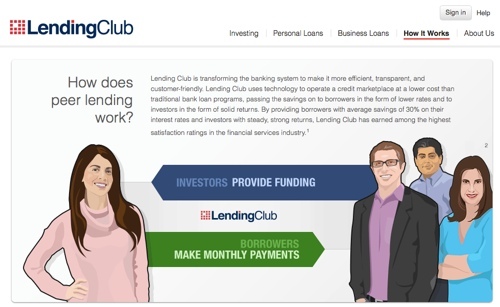 In the first nine months of 2014, Lending Club’s net revenues climbed to $143 million, more than double last year’s mark. Since its founding, Lending Club has financed more than $6 billion in loans and investors on the platform have earned more than $590 million in interest. One of the under-discussed aspects of Lending Club’s decision to become a public company is the fact that the platform will be available to a significantly larger number of Americans. Previously, access to Lending Club was a patchwork quilt of differing state regulations, with some states allowing borrowing from the service but not investing and others having the exact opposite regulation (investing, but no borrowing). And there were some states were the service was not available at all. As a public company under federal regulations, Lending Club can operate in any state. Another interesting theme of the Lending Club IPO is the way it will be seen as a test of the public investor’s appetite for what Mad Money’s Jim Cramer referred to as “crowdsourced lending” in his discussion of the company. Alternative lender OnDeck, which specializes in small business lending, is scheduled to go public within days in an effort to raise between $150 and $180 million. Others see the Lending Club IPO as potential validation of broader interest in fintech innovators as a whole. Lending Club demoed its technology as part of the inaugural Finovate conference in 2007 and again in 2009 for Finovate Startup. Read our CEO interview with Renaud Laplanche.